I don't ever shop at MAC. I'm not sure why, maybe I was afraid of the prices, or maybe because we don't have an actual MAC location around here (even though I'm in a fairly large city). We have a small kiosk inside of The Bay (all you Canadians know) but I've never really stopped to look or shop there. Well that changed when I saw that MAC Giambattista Valli collection. I had to have that orange lipstick. I'm not even an fan of orange anything, but it's so pretty. I found out the name was Margherita. And I had to have it. I spent days deciding what else I had to have, because I wanted to shop online, I needed a minimum amount to purchase to qualify for free shipping. ALWAYS a catch lol. Anyway, I decided I wanted to try the Studio Fix Powder plus Foundation, and the Viva Glam Miley lipstick. Not pictured is the powder, but it looks like a normal powder, lol. I can do a separate review. Look how pretty that Margherita is! It's so beautiful! 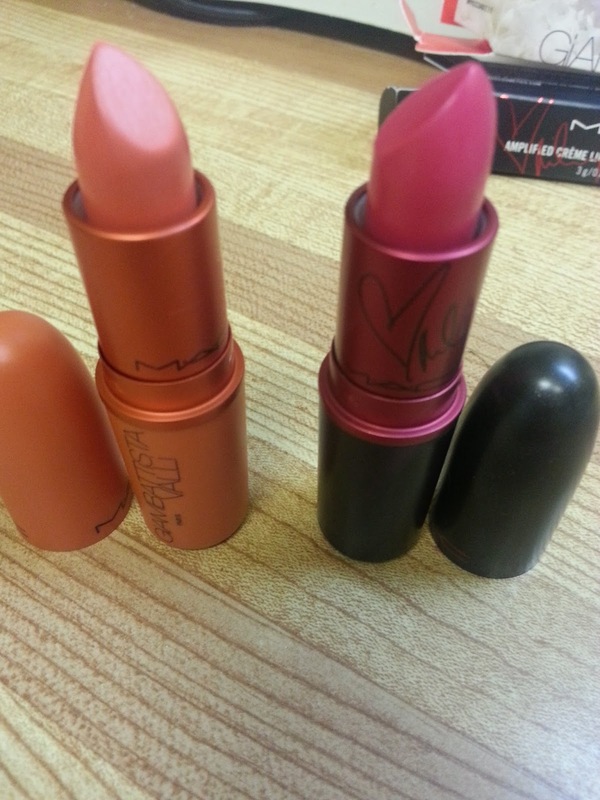 And I knew I would really like the Viva Glam Miley Cyrus lipstick because its pink. 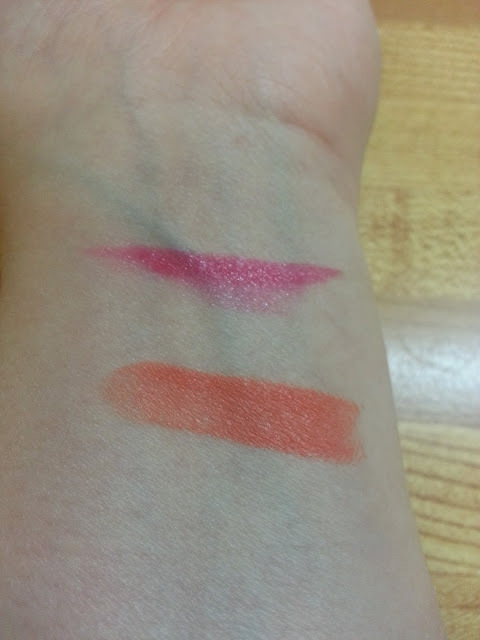 Top: Viva Glam Miley Cyrus Lipstick - I love love love this pink! It goes on so smooth, and not patchy. I love the shine. It's a little brighter than I am used to, but it's pink so it works. It also fades throughout the day, but leaves behind a bit of a stain, which is nice because it looks like you still have some colour on your lips. Bottom: Giambattista Valli Lipstick in Margherita - as you can see, this pulls VERY orange on me. It's a little too much to be honest, but I find if I put a lip balm on first, and very lightly pat this on my lips, it's not too hideous haha. But it's such a beautiful colour! It does have a matte finish which does end up looking a little spotty, so you definitely need to exfoliate those lips before wearing it!